President Muhammadu Buhari has returned to Abuja from New York where he participated in the 73rd Session of the United Nations General Assembly.He aslo attended other official engagements on the sideline of the UNGA73 between Sept. 24 and Sept. 29. The theme for this year’s Session is: ‘Making the United Nations relevant to all People: Global Leadership and Shared Responsibilities for Peaceful, Equitable and Sustainable Societies’. The News Agency of Nigeria (NAN) reports that the presidential aircraft conveying the president, his wife, Aisha, and some members of his entourage took off from JFK International Airport on Saturday and landed at the presidential wing of Nnamdi Azikiwe International Airport Abuja on Sunday morning. The Chief of Staff to the President, Malam Abba Kyari and the Inspector-General of Police, Ibrahim Idris, were among government officials who welcomed the president at the airport. The highpoint of Buhari’s participation was his address on Tuesday to the General Assembly on the opening day of the General Debate. The president, in his presentation of Nigeria’s National Statement, sought global cooperation on security, anti-corruption, irregular migration, climate change, and UN reforms, among others. 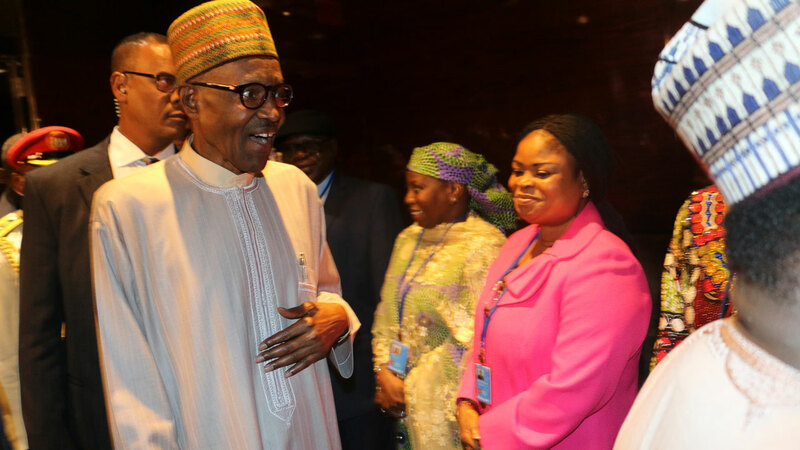 Buhari and his wife also attended a welcome reception hosted by the UN Secretary-General Antonio Guterres and his spouse for Heads of State and Government and their spouses. The president and his delegation attended the high-level ‘Mandela Peace Meeting on Global Peace’ in honour of the centenary birth of late South African President Nelson Mandela. The Nigerian delegation also participated in a high-level meeting on the ‘Fight against Tuberculosis’ organised by the World Health Organisation (WHO). Nigeria currently ranks seventh amongst the high TB-burden countries globally, and second in Africa, where Mrs Buhari also delivered a statement. The Nigerian delegation attended a high-level meeting on financing the 2030 Agenda for Sustainable Development and World Economic Forum’s Sustainable Development Impact Summit. Others are the ‘Second Annual Bloomberg Global Business Forum, high-level Meeting on Action for Peace-Keeping’; ‘Commemoration and Promotion of the International Day for the Total Elimination of Nuclear Weapons’, high-level meeting on the ‘Third Industrial Development Decade for Africa’, and ‘Pathway to Localising a Global Agenda’. Also while in New York, Buhari had bilateral meetings with many African and world leaders including Bill Gates with a view to promoting national and African interests.Buhari also had interactive session with a selected group of Nigerian professionals based in the United States and Canada.